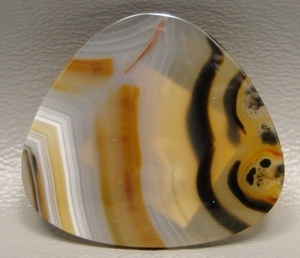 Designer or custom cut cabochons are usually semi precious stone cabochons that are not cut in mass production or standard or calibrated shapes and sizes, but rather each jewelry stone is individually cut to maximize its quality of pattern. First we slab a piece of rough rock. Then each stone slab is evaluated. Some stone slabs are even discarded immediately. The ones with good pattern and color are examined closely. Flaws and fractures are avoided. 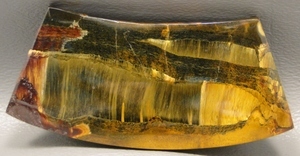 The slab is cubed up, sometimes the very heart of the stone is cut out and the slab may produce only one designer cabochon. 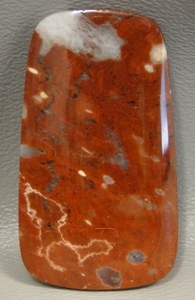 Then to maximize the pattern, a shape of the cabochon is chosen. 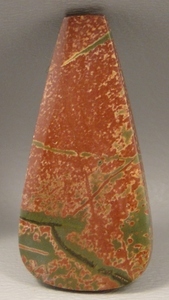 Sometimes the pattern is too large to look good in a small stone. Or the pattern looks better in a round or a free form shape. Some shapes are very unique. These inspire the jeweler or wire wrapper to be very creative and make for a very unique piece of jewelry. Some shapes are common: ovals, rounds, triangles. Shapes that aren't a standard shape are called freeform. 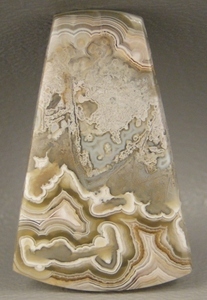 Some freeforms are so unique you may never see another stone cut that way again. But most freeform shapes will be repeated. Even though the shape is the same, the size, color, or pattern of the gemstone material will vary-insuring you still can create a one of a kind piece. Each custom cabochon cutter may have their own shapes or names for those shapes, but often the shapes will be similar to another cutters. So what do you do when you see a shape you really like and want to find more of the same? That is why I have developed this guide. Below I will try to assign names to some cabochon shapes Barlows Gems uses. You can enter those names in the search boxes and see all the stones that we have in that shape. Please search by singular, NOT plural (oval, not ovals). You can also search by size (i.e. 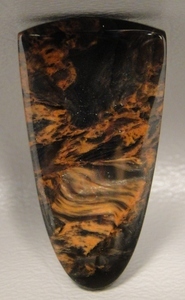 a 30 mm round), or color. Remember to check a millimeter size larger or smaller too, as a slightly larger or smaller stone may still fit into your design! Triangle: Though ovals and rounds are pretty self-explanatory, there is a big selection of triangles. Sizes and shapes can vary a lot. Trillon: Triangles where all 3 sides are equal length are referred to as trillions. Bowed triangle: Where the sides bulge or bow outwards. and Rounded triangle: Where the corners or points are rounded off. 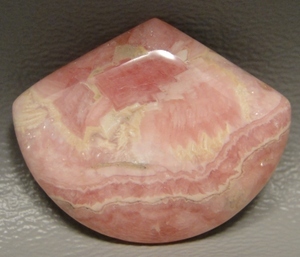 Square: Stone cabochons are rarely cut into a perfect square, usually the corners are rounded. Shield: is an oval cut in half. Also may look like a short tongue.